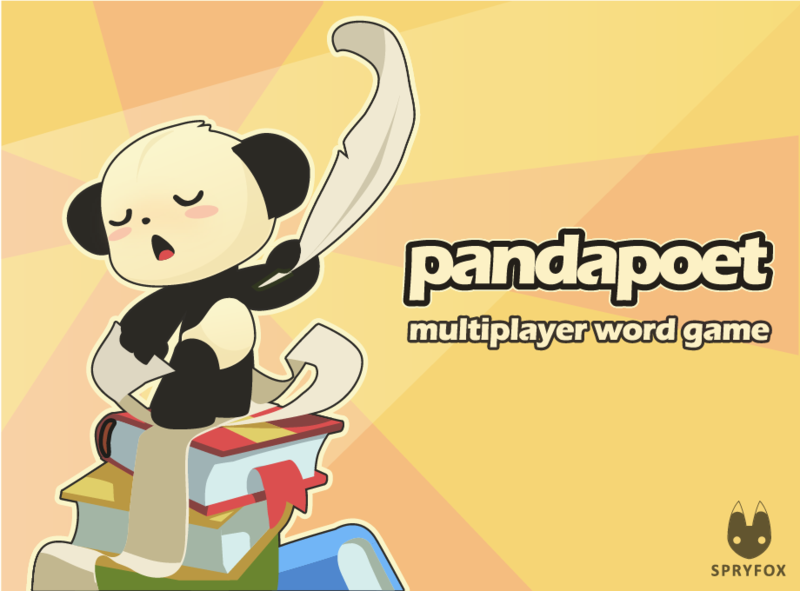 Way back in 2010, Spry Fox put out a single player word game for the Kindle called Panda Poet. 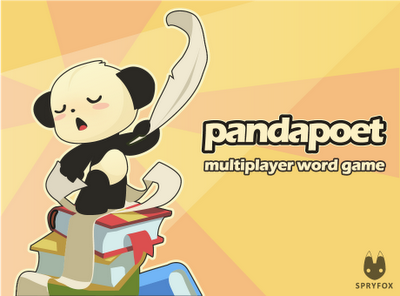 I had always had some vague ideas for a multiplayer variation so when an opportunity came up to create an original HTML 5 game, I pitched play-by-mail Panda Poet. As David says over on his blog, this is our third release this month so things have been a wee bit hectic. Reminder to self: do not launch multiple new games while attempting to vacation in Japan. As with all my projects, we spent the first few months heavily iterating on prototype designs. I went back to the root of the original concept and ended up deviating substantially from the single player mechanics. 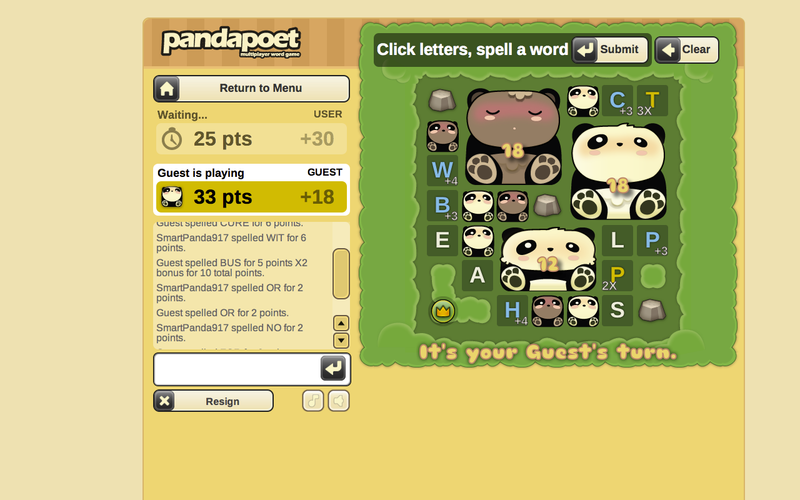 The game still involves growing pandas by spelling words. But now the game is based around a capture mechanism that lets you take pandas from the other player. The territory aspects of the game give play a rather unique feel and the end result reminds me of "Scrabble meets Go." The timer countdowns that were such a large part of the single player game are gone. Playing against another player who constantly creates words out of any letters you didn't use ends up being more than enough pressure to give the game forward momentum. The arrow of play is strong in this one. 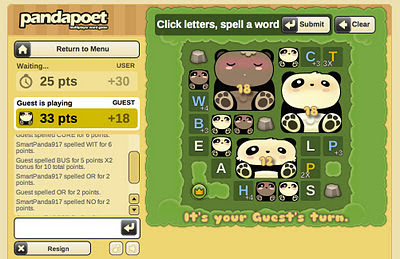 Go give Panda Poet a try over at game.pandapoet.com. Or install it on the Chrome Web Store. Invite a friend to play. It is more fun. Most multiplayer games played over the computer aren't very social. In console games, you get a lot of teabagging and swearing with very little space or time set aside for meaningful social dialog. In games on social networks, you find people poking one another using cynically automated systems. There's a pushy one-to-many broadcast aspect of the experience that does little to encourage deeper social bonds. My wife is a longtime player of Words with Friends and seeing her chatting with complete strangers for months on end reignited my interest in play-by-mail games. You can think of these games as a bit like a conversation. You make a statement by playing a turn and then pass the conversation onto the next person so they can respond. Side by side with the game is a chat window, but the important realization is that both the chat and the moves you make in the game are forms of communication. Every interaction is opt-in: Everytime you choose to make a move, you are signaling that you want to continue the relationship. There's little penalty for dropping out. Relationships grow over time: Many random matches put strangers together. Initially, people play silently for long stretches of time. However, very slowly you get the occasional safe comment. Eventually this blossoms into more detailed conversations. Trust comes from a long series of safe and reliable interactions. Each time you submit a turn, you are building trust and respect. Griefing is difficult: If someone is rude, you just resign from the game and stop playing with them. Or you don't play the next turn. It is possible to spam someone, but number of people effected is so minimal and the feedback in response to your Killer cleverness so sparse that it is rarely worth it. The typical incentives driving griefing fizzle without an audience or social status. You can build on existing relationships: When was the last time you did any activity with your brother or close friend from college that now lives a thousand miles away? We live in social world fractured by Schumpeter's creative destruction. You dwell in distant lands as determined by the latest job opening. As a result, the deeply meaningful local relationships that dominated life of eras past suffer. Social isolation is a very real consequence of the capitalist eradication of that most charming of labor rigidities, a generational home. Games like Panda Poet give you a private shared space to reconnect. Take five minutes out of your day and create a new experience with the ones you once held near. I see immense potential in this style of game and I'll be using similar multiplayer structures in future games. When you design a game with real social play, ask "What is the intrinsic rhythm of back and forth conversation between participants?" If this key pattern has no space to exist, then perhaps you aren't creating a social game after all. Easy initial learning curve: People get that you are supposed to spell words. There doesn't seem to be much confusion over the basic UI. The game is reasonably well balanced. I've seen multiple games between two skilled players that are decided based off the final few words. You almost never find yourself halfway through the game in a position where it is impossible to make a comeback. Pacing: I'm adore the short play sessions (a single turn takes 10-30 seconds). However, since players can have multiple games going, you get a random distribution of games popping up throughout the day much like email or an IM conversation with a friend. This combined with a daily email archive prompting people to check back into the site and catch up on waiting games should yield a reasonably high rate of retention. Complex capture mechanics: The capture mechanics are a dash too complex for casual players to understand the strategic elements of the game immediately. In particular, it takes multiple games for players to understand how to lock in pandas mid game. Poor monetization opportunities: Right now there's just an initial Premium version that removes ads and gives access to a more expansive and strategic board layout. My suspicion is that we are going to need to do a lot more work to craft a compelling offer. Today, we are launching Steambirds Survival for iOS. The layout has been rejiggered to work nicely on the iPhone. And there's a wonderfully expansive HD version for the iPad that it easily my favorite way to play Steambirds. The Android version will follow shortly. All of them are free, so give it a go and let me know what you think. Though this new mobile version of Steambirds Survival shares the same name as web-based game, by partnering with Halfbrick (of Fruit Ninja fame) we've transformed it into a much bigger (and my opinion, better) game. Free-to-play: This is our first free-to-play game on mobile. Like most of our games, we take the 'free' part pretty seriously. I want people to buy because they love the game and can't get enough. I'm very curious what lessons we'll learn. Multiple player planes: We added a really fun recruitment system that lets you hire multiple player controlled planes. Running through a level with three Chickadees feels amazing. Previously lackluster planes like the Cockroach turn into fascinating exercises in multi-plane tactics. New Reinforcement powerup: You can call in NPC allies to fight along side. This leads to rather epic mix ups with dozens of planes pinwheeling about in a deadly dance. Does your game have a clear "Arrow of Play"? After launching the web version of Steambirds Survival, I was unhappy with the mission structure. Originally there was an open list of planes that you could unlock in any order. It seemed like a good idea at the time since 'openness' and 'choice' are good, right? But we saw that a lot of players would cherry pick a few planes and then after they found one that they liked, they'd just play that plane to grind the in-game currency, copper. As a result, the progression lacked a clear feeling of momentum that encouraged you to trying out a wide variety of different play styles. With the new mission structure, you unlock cities one at a time and each city reveals more cities to play. Within each city, there are 8 sub-missions that give the player to demonstrate increasing levels of mastery to pass. Now, there's a very clear direction to the unlocking and this should give players short term and long term goals to work towards. In physics, Arthur Eddington coined the phrase 'arrow of time' to describe how time appears to flow in a single direction. As you dabble in general relativity, you realize that time is wonderfully compressible and can be manipulated in a variety of clever ways, especially near the speed of light. Yet even with all this variation, it consistently advances forward. When I look at a design, I always ask "What is the arrow of play?" This is a directional property of the mechanical systems that always moves the player forward. And like time, there's often a surprisingly amount of variation that occurs along the way. Some players advance slowly, others take strange side paths, but all advance. In Steambirds Survival, there are a variety of systems that result in a distinct arrow of play. Inevitable decay: Plane health almost always goes downward. There are very rare health boosts, but they are at best a temporary reprieve. Escalation: Enemies slowly increase over time. Waves get larger. Difficult enemies spawn with increased frequency. Even the best players find themselves at a point where they can't fight back the chaos any longer and errors creep in. Short term goals: Short term, you are trying to live long enough to complete mission goals that are just on the edge of your capabilities. Repeated patterns: Each mission goal unlocks new mission goals. Once you learn the pattern you can repeat it again and again building momentum like train wheels accelerating down the track. Resource flow: Each goal you complete earns you copper, which you spend to either facilitate the completion of goals or to unlock new cities. There is a clear resource flow from sources of currency to sinks of currency. Limited choices: Unlocking new cities in turn lets you unlock more cities, eventually getting to the point where you have explored all the content in the game. At once point in my career I thought linearity was a curse. And it is when taken to extremes. But it is also a tool. If you end up overwhelming most players with too many choices, the perceived quality of the choices provides goes down. In Steambirds Survival, there are always at least 4 choices. You can unlock up two cities. Or you can attempt missions in at least two cities. The hope is that it is clear what to do next. Games are about change. The system moves from one state to another at the poking and prodding of the players. Each tick of the clock or press of a button creates momentum that leads the player on a joyful rush through challenge after mastery challenge. You start slowly. The player builds speed and eventually they steam forward in a continuous state of flow. The arrow of play leads inevitably to a sense of pacing. Yet critically it approaches these not from a traditional narrative perspective, but as a property of the game systems. The beats of the game rhythm are those clicks and taps turning tight loops over and over. Steambirds is a turn-based strategy game, a genre typically seen as a slow and plodding. Yet in the middle of a dog fight, it can feel like an action game. A system that lacks a clear arrow of play results in players being mired in odd dead ends. It isn't enough to make a game that has feedback loops, widgets to master and all the various atomic elements of a game. It also needs a strong sense of momentum that like time or entropy hurtles the play forward. Exciting times. 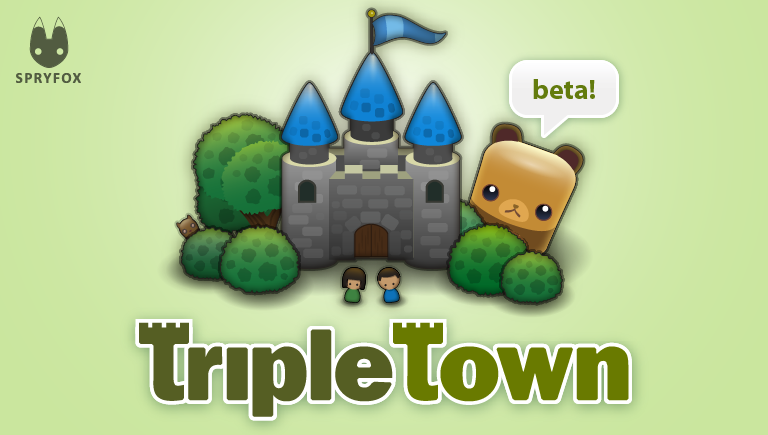 You can now play our puzzle game Triple Town in your web browser. We are releasing it as a beta and the game should evolve quite substantially over time. Huge kudos to Cristian Soulos for making this project blossom after a long winter. You can play it here. Triple Town is a special game. It has the highest user rating of any of the games I've designed (94%). It is also the only one of my designs that I go back to again and again. Why is this? On the surface, it is a simple match-3 variant, but after a few games you'll start noticing the strategic depth. The pacing is...uncommon. There's a relaxed mellow rhythm to the game where you casually make dozens of micro decisions. Yet these decisions add up to games that can last upwards of a week for advanced players. After a while you realize you are playing the Civilization of Match-3 games and that you care deeply about what you are building. That burst of strong emotion always surprises me. The big addition for this release? Bears. Pride: When you create a great city, you want to share it. People take screenshots. They brag. Pride in what they've built is the primary emotion that drives players of Triple Town. Curiosity: You want to know what the next item looks like. Some people are driven to get a castle for the first time. Hate: You learn to hate the teleporting Ninjas. They never attack you, but they end up blocking your plans. Sadness: You have slight sadness the first time you kill a bear. Then you learn to steel yourself against the emotion. Irritation: When fate gives you the wrong piece at the wrong time. Competition: When you notice that your friends are doing better than you. Despair: When you feel the board closing in and realize that you can't possible catch up to your friends. Relief: When the board is filling up and then you perform a miraculous move that empties a swath of the board and helps you start afresh. Games are great at eliciting primary emotions. They don't need the Hero's Journey, they don't need story, they don't need hyper realistic visuals with immersive first person cameras. You can create an emotional, deeply meaningful experience simply by using the fundamentals of system design. When I revisited the Triple Town design, the emotions were already clearly evident. However, I wanted to explore how I could more directly shape those emotions to fit my vision of the game. Emotions are complex to say the least so we need some sort of entry into the topic. There's a general consensus that you can divide emotions into rough categories. For example 'negative feelings toward others.' Then within those rough categories, you see variations that we recognize as distinct emotions. For example, hate and irritation are actually highly related and are typically related to a sense of loss or constraint caused by others. As a designer, how do I push the conditions that elicit a general class of emotion so that I can dial in the emotional variant that I desire? The system-derived context of the situation you are in. Recalled cognitive labels of related past experiences. If you can evoke a general class of emotions with game mechanics, then you can apply evocative stimuli to label and therefore tune that response to elicit a specific emotion. Consider a very basic example of labeling in Triple Town. The raw materials I was working with was an observation that players felt immense sense of relief when they killed annoying NPCs. I experimented with applying various labels to see how we could tune the response. Pass 1: During one early prototype, the NPCs were accidentally displayed as small children. Naturally, players felt bad when trapped them and they turned into grave stones. Accidental deaths led to guilt and sadness while deliberate deaths evoked a dissonant feeling of cruelty. Pass 2: So next we switched them to evil looking monsters. This was a dramatic change. Now players felt righteous glee when they trapped and killed the monsters. 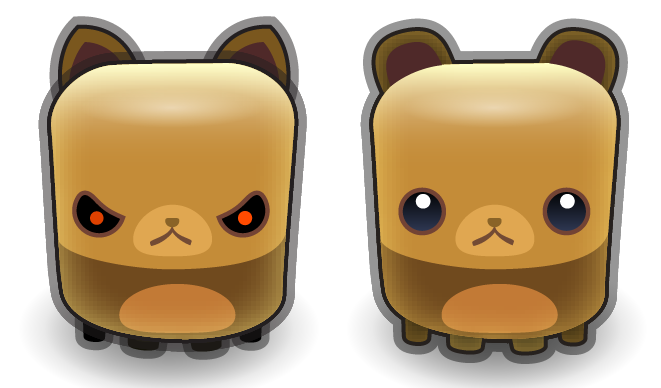 Pass 3: Finally, during this latest build, I settle on bears that have slightly evil looking eyes. Most players feel fine killing the bears, but for some there is a slight edge of ambiguity that makes them uncomfortable. 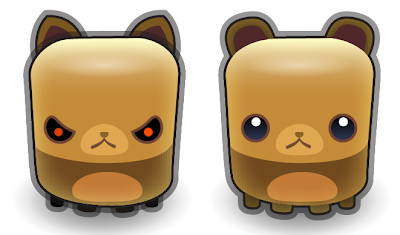 Future passes: Now that I've explored the emotional space a little, I've set up the bears so that with one simple tweak of the eyes, I can make the bears incredibly cute and bring back many of the feelings of guilt and sadness. In essence, I was balancing and tuning the player's emotional response. Much like Sid Meier using a binary search ("double it or or cut it by half") to narrow in on the correct setting in his game, I was trying out various extremes to narrow in on the appropriate emotion. Using evocative imagery is a common enough practice, but in practice the labeling of NPCs is functionally quite different than merely putting up a picture or cut scene of a dead child. The bear is not an image for the sake of being an image. Instead you create a distinct label that is only meaningful due to how it builds upon an emotional foundation derived from play. Without the mechanics, you just have a picture of a bear. With the mechanics setting the context and providing the raw emotional reactions, you craft a carefully refined emotional moment. With the children images in the first pass, I saw an example of dissonance. It is easy to add a poorly fitted label that confuses the emotions the mechanics are eliciting. 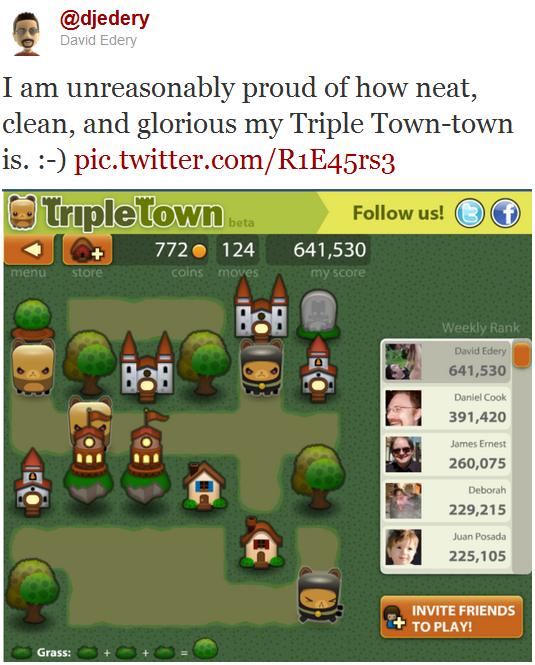 The heart of Triple Town are the strong feelings of pride and accomplishment. These comes directly from the rather amazing investment in extended tactical play that the player exerts when creating their 6x6 city. A well crafted city can represent hours of carefully considered labor. In the Kindle version of the game, I used the sort of end game tropes that you find in Tetris or Bejeweled. You play the game, you get a score and then move onto the next game. Most designers rely on proven fallbacks to get the job done since it is difficult to always be reinventing the wheel. Unfortunately, this 'obvious' design choice conflicted rather painfully with the slow and steady building of pride. There comes a point at which the player presses a button and in the act of creating a new game, erases all their hard earned progress. It is surprisingly how many times I've let the game sit on the last screen, not willing to leave it behind. The label of 'its just a game session that you finish and move on from' didn't fit the emotional response that the other systems were creating. 1st pass: The first attempt at fixing this involved added coins so there is some persistent resource you take with you after each city. That helps a little, but not enough. Coins are merely a resource and players weren't sad because they were losing some simple generic token. 2nd pass: The second attempt involved the ability to flip back and look at your city a last few times before you move on. This was quite effective since it lets the player say goodbye. The emotional dissonance was channeled into an activity that let players come to terms with it at their own pace. This still isn't good enough. Luckily Triple Town is a service, not a game that gets launched and forgotten. As I design future features, I'm explicitly creating them to amplify the feeling of pride. Fresh in my mind is the lesson that even something as simple as how to end the game involves labeling the context. What if instead of ending the game, you are finishing cities? These individual emotional moments form a unique emotional fingerprint for Triple Town. Due to dissonance, you can't simple apply any theme to this set of dynamic emotions and still end up with an emotionally coherent game. Instead, you want a theme that fits the mechanics like a glove where the emotional beats elicited by the system dynamics have a clear connection with the labels you'd applied. 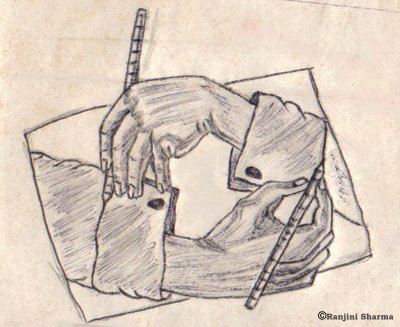 With Triple Town, as with most of my designs, the theme and metaphor for the world came from watching people play. I would observe and note the emotions and then ask questions about the fundamental nature of the experience that was evolving. Is this a game about exploration? Creation? Building? If it is a game about building, what is a related theme that matches the current unique fingerprint? Are you building real estate? A tomb? What are those NPCs doing if that is the case? After playing many hundreds of hours of Triple Town, I settled upon a metaphor that fit all the nuances of the mechanics. Triple Town is a game about colonization. 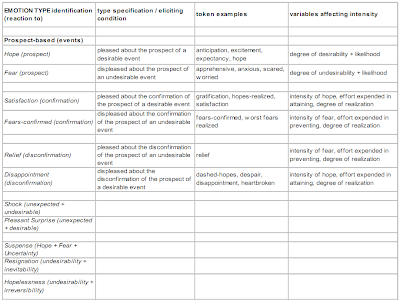 Consider the following common dynamics and how labels derived from the metaphor tie them together in a coherent setting. You've been ordered by the empire from across the sea to build a new city on virgin territory. In the process, natives (depicted as less than human) keep showing up on 'your' land. They never attack you, but they keep preventing you from expanding. So you push them off to the side. More experienced players create small reservations and pack the natives in as tightly as possible. Due to overcrowding the natives die off en mass. You use their bones to build churches and cathedrals. When particularly difficult natives appear that seek to escape your reservations, you bring out your overwhelming the military might and remove the pest so you can continue with your manifest destiny. The match between the theme of colonization and emotions of the mechanics was so strong, I tuned it back slightly so it wasn't quite so on the nose. Instead of selecting a recognizable group that suffered under colonization, I made the NPCs into morally ambiguous bears. It would have been very easy to present players with a choices that were obviously black and white where players fall back on pre-learned schema. However, I'm more interested in the edge cases in which a player does something they feel is appropriate and then as time goes on they begin to understand the larger consequences of their actions. At this point in the development of the world, player should naively explore the system and due to the dynamics of game, then form a strong justification of their role as colonists. What started as an abstract game is slowly but surely turning into a rich world. What is beyond the city walls? 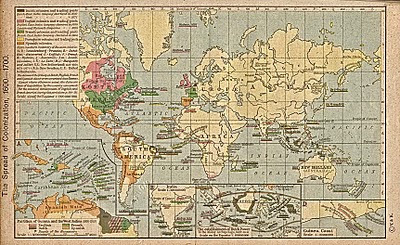 Long term, the themes of colonization, imperialism and the impact on native cultures will unfold over a series of planned game expansions. With slight variations in labeling, I should be able to tune in a variety of powerful emotions related to the theme of colonization. Unique mini-games and puzzles used to support narrative: One extreme example of this is your typical adventure game where instead of a core mechanic, you have a series of plot appropriate puzzles. The emotional aspects of the puzzle (frustration, delight) are only marginally related to the emotional beats of the plot. Also, in order to avoid dissonance with the wide variety of emotional beats that the story requires, the style of the puzzles is switched up on a regular basis. It is hard enough balancing one game, but asking the team to balance dozens of tinier games results in shallow systems throughout. I think of this as chopping up gameplay to fit the story. Generic gameplay that supports the narrative: A Japanese RPG like Final Fantasy repeatedly uses turn-based tactical combat to illustrate story beats. The time-tested tactical combat system usually produce a handful of primary emotions such as loss, victory, relief, feeling powerful and feeling powerless. No matter what story is being told, the same system is called upon to provide emotional support. Such a pattern avoids dissonance the majority of the time, but then when the plot veers into non-combat area, the dissonance comes back full force. I think of this as telling more story than the gameplay can naturally support. Some of the most painful design rat-holes I've have ever dug myself into followed these patterns. In one project, I created a world based off finding relics from a post-Singularity civilization (circa 100AD) deep in the Mediterranean. In another, I was overly attached to a set of small bobble-headed creatures. For both, I was afraid to change the world. Instead, I desperately iterated upon new game mechanics, hoping to find one that fit my world better. And I rarely found one. As far as I can tell, creating a compelling new game mechanic is hard and success is unpredictable. Yet creating a functional game world's is surprisingly cheap. Any idiot can copy a working game, toss some pirates on top and call it good. Now I follow a different philosophy that better reflects these costs. Gameplay comes first and the worldbuilding are flow from the dynamics of play. If, as you iterate upon gameplay you make a rule change that breaks the emotional connection with a particular world, you should feel very comfortable tossing that world aside and starting fresh. Create a world that supports the game, not the other way around. The amount of theming and world building in Triple Town is still quite light. Those of players used to the extravagant productions that burden a game with an overworked story may not even recognize the labels I've choosen as having an impact on your experience. Yet they do and most players will feel the emotional beats of the game quite clearly. Nothing I've outlined here is new. The important insight for me has been creating the labels and world for a game as a bottoms up process. You start with the mechanics and then find the labels that fit the emotional beats. From this game play foundation, you build the world. Enough rambling! Go play Triple Town. It is still a beta so let me know what you think. Observe the emotional reactions of the player within that system. Adjust the system's emotion eliciting conditions to increase or decrease particular raw emotional reactions. Once you have a rich set of desired emotional responses, brainstorm natural labels that refine the emotions. Test the labels and see how they elicit specific emotional variations. Bundle the labels into a metaphor for your game that communicates and amplifies its unique emotional fingerprint. Low likelihood: If the player predicts a particular result, but they know from past experience that it is highly unlikely, they typically won't be overly dissapointed. High likelihood: Yet the likelihood is high and the outcome doesn't occur, dissapointment will also generally be more pronounced. By adjusting variables such as likilihood, degree of effort or value of results, the designer crafts a set of 'eliciting conditions'. I love this phrase since it gives us game friendly terminology for discussing emotion without reverting to the fuzzy non-functional handwaving of the humanities. By setting your system variables appropriately, you can create eliciting conditions that spark specific categories of emotion. Often the best video games have disjointed, narratively surreal worlds. Mario, Pacman, Katamari, Bejeweled and even a game like Portal take place in distinctly surreal locations that obey the logic of association, but are freed from the logic of the real world. Even more interesting is that despite immense amounts of effort making our labeling systems externally consistent (They aren't 'save points', they are regen tanks), the vast majority of players happily engage in surrealist worlds with nary a complaint. If anything, the unnecessary justification introduces more unnecessary dissonance into the game by asking the player to pay attention to details that don't functionally matter. I see this surrealist aesthetic as the practical outcome of deriving the world from the emotional beats of the gameplay. The constantly tuning and tweaking of various labels needed to bring out the best parts of your game fragments the traditional narrative process. Why is there a walking turtle? Because it fits the mechanics like a glove. That is all the justification that is required and layering on more burdens both the experience and the development process. In the end, light surrealist labels are a positive thing since they gives you substantial wiggle room to avoid dissonance. And due to the solid fit with existing emotional dynamics, they often yields stronger game-centric experiences. Consider: It is a distinctly different thing to feel sad while reading about a dying mother than to actually feel sad because your mother is dying. The former is a shadowy reflection that we intuitively understand is not immediately threatening. The later is raw, primary and life changing. I've yet to see existing terminology for this phenomena, so at the risk of stepping on existing toes, let's use the following labels. Primary emotions: The emotions we feel when we are in a situation with real perceived consequences. "When we make decisions, we must assess the incentive value of the choices available to us, using cognitive and emotional processes. When we face complex and conflicting choices, we may be unable to decide using only cognitive processes, which may become overloaded and unable to help us decide. In these cases (and others), somatic markers can help us decide. Somatic markers are associations between reinforcing stimuli that induce an associated physiological affective state." Crucially, the theory identify two distinct classes of emotion. The first is the 'body loop' which corresponds closely to primary emotions. The second is the 'as-if body loop' which corresponds to shadow emotions. No doubt this is a well studied topic, so if someone educated in the neurosciences is able to provide even more accurate labels or links to additional models I'll happily amend this essay. The distinction between these two classes of emotion may seem academic, but I find myself fascinated by a game's ability to provoke primary emotions in a manner that is difficult if not impossible for more reflective forms of media. As a game designer, I can and have put the player in situation where they experience real loss. The best a movie or book can manage is evoking a shadow of loss. A small bit of background is necessary to describe the mechanism of shadow emotions. It starts with the link between memory and emotion. Memories come loaded with judgments. In some sense, the true function of memory has been polluted by a modern concept of coldly analytic 'data storage'. Perhaps a better term for 'memory' is 'lesson'. Each memory has deeply integrated emotional tags that informs us of how we might want to react if we call upon that memory in relation to our current stimuli. When you see a dog sitting on the sidewalk, you instinctively compare it to your existing mental models and memories of past dogs. In that basic act of cognition, you nearly instantly become awash with emotions. Perhaps you feel a sense of comfort and fondness. Or perhaps a wave of anxiety passes through you as you recall the sharp teeth of past encounters gone awry. In a split second, you know exactly how you feel about that dog. One way of thinking of emotion as an early specialized form of cognition that serves a clear survival function. Quite often you need to make a decision, but you don't have time to think about. Quick! Act now! At this moment, you are flooded with an emotional signal. It is strong, primitive and highly effective at making you either run, attack, bond, threaten or pause. Emotions tied to memories help us boil vast decades of experience down into an immediate instinctive reaction. Hair trigger emotions exists because more complex cognition takes time and for certain classes of decision, delays yield failure and failure is costly. If you are attacked by wolf, it likely isn't prudent to debate the finer details of how you classify canids. Much later, be it seconds or hours, your conscious understanding of the situation kicks in and moderates the emotional response. More often than not, what we think of as consciousness is little more than a post processed justification of our ongoing roller coaster of instinctive emotional reactions. Emotions are necessary but they are not civilized. It is easy to imprint rapid fire lessons that trigger at the worst possible moment. A child who learns to lash out in anger as a way of surviving neighborhood bullies might have difficulty as an adult if he reacts the same way when he perceives a more subtle theme of bullying from his boss. What makes managing emotions so tricky is that such emotional triggering situations unfold before we are even aware they are occurring. Emotions are by definition lessons turned into lightning, unconscious action (or inaction as the case may be). You cannot easily or consciously stop emotions in full activation; however you can train them ahead of time. One method (of many!) is to test and explore our emotions in the safe mediums of narrative, sound and imagery. The mechanism for triggering a safe emotional response seems to be primarily based off a mixture of empathy and the emotional aspects of memory that we've previously covered. Stimuli: When we see or read a particular evocative narrative or scene. Conscious understanding: We process the resulting safe emotions from a safe distance. Now imagine that you read about the dog sitting on the sidewalk. You can confront your anxiety with crystal clear understanding that he cannot hurt you. You activate your empathy and simulate how you might feel if the dog were in fact in front of you. Now you roll the emotion around and savor it, examining it from multiple angles. You instinctively role-play the scenario. Perhaps you become comfortable with the idea that you don't need to immediately run away from all dogs. By storing this revised impression, you slightly moderate your future emotional reactions. In a biological sense, this is a surprisingly inexpensive method of practicing how to moderate our emotions. Instead of placing yourself in potentially mortal danger, you can instead read about what it while sitting in a chair. The training that occurs is not perfect, but I suspect that it helps. There is a wide body of experimental research that shows how emotions are differentiated through a process of psychological response and then the application of a cognitive label. If you can practice labeling a rush of adrenaline as bravery instead of fear, you may be able to successfully alter your emotions in real world situations. Though by no means proof of this theory, it is suggestive that many popular fictional and artistic works are highly focused on evoking emotion and chains of strong drama. Situations that are risky, expensive or socially compromising regularly find their way into the evocative arts and enable us to practice those scenarios in a safe fashion. The relatively safe emotions that result from consuming and simulating evocative stimuli are what I'm calling shadow emotions. A shadow emotion is by no means a 'fake' emotion. Your heart rate increases, your palms sweat. The patterns of the past carry echos of real emotions and your body responds accordingly. All the physiological signs of experiencing an emotion are present. However, you know intellectually it is a carefully controlled experiment. Despite hysterical claims to the contrary, humans appear to have a surprisingly robust understanding of simulation vs. reality. We labels our simulations as such and can usually set them aside at our convenience. Shadow emotions are by no means completely safe. Anyone that goes through a therapeutic process where they directly recall past trauma can bear witness to the fact that recalling strong emotions is an intense and even frightening experience. Distance matters when role-playing stored emotions and the more closely you simulate the original event, the stronger the response. Personalize the stimuli to better match the emotional history of an individual. As an artist, a story teller and a game designer, I've used all of these and they are far less mysterious than many would presume. When such techniques are well executed, you'll increase the intensity of the evoked shadow emotion. The word 'evoke' is key since our concern is more about using a signal to trigger emotions that already exists. As such I think of these techniques clumped primarily into methods of simplifying processing our evocative signal or methods of increasing strength of that signal. Shadow emotions absolutely exist in games. In fact, the game industry spends ludicrous sums of money attempting to ensure that high end console titles are as good at evoking shadow emotions as media such as movies or books. During the dark reign of the techno-cultists who preached the ascendancy of visual immersion, realism and games as predominantly narrative medium, a thousand chained craftsmen made heroic attempts to evoke stronger shadow emotions. See such baroque creations as Mortal Combat, God of War or L.A. Noire. This expensive pursuit will continue because humans crave shadow emotions as a path to more effective emotional cognition. Game developers, as paid schmucks making disposable and consumable media, have an economic incentive to fill this need. The next time you safely experience the emotion of shooting a minority-skinned terrorist in the head and watching the beautifully rendered blood and brains splatter in slow motion, step back and consider the emotional role-playing that you are simulating. It obviously isn't real, but you do feel something. Perhaps it is even therapeutic. These are shadow emotions in action. I remain unimpressed, but perhaps if we render those skull fragments at a higher resolution, AAA games will one day achieve something deeply meaningful. In this expensive pursuit of shadow emotions, we may have accidentally sidelined deeper exploration of a phenomena more fundamental to the emotional capabilities of games. I spend large portions of my day observing game players. Some of this is observation of others, but there is also a peculiar detached observation of my own reactions to a particular game or prototype. Repeatedly, I see sparkles of emotion that seem to have different roots than shadow emotions. A player might become frustrated that they don't understand a particular level layout. Or they may feel anguish when their character suffers permadeath in Realm of the Mad God. Or they may feel elation at finally getting the long tetrimino necessary to clear four rows in Tetris. I would make the bold and perhaps unsupportable claim that these responses are not a reference to a past emotional experience. Instead they seem to be derived from much more primitive circuitry. Where do emotions originally come from? Not all are reflections of memories past. There are means of creating emotions from scratch. Consider the sense of anguish that one feels when the character you've built up over many hours of dedicated play dies for all eternity. This system, permadeath, is quite uncommon in many modern games, but thousands of players go through the process everyday in the game Realm of the Mad God. As a designer you can think of this experience in almost purely mechanical terms. A player invests time and energy into accumulating a resources and capabilities inside a defined value structure. Then due mostly to a failure of skill, the player gets hit with a barrage of bullets and that investment is irretrievably lost. Despite the coldly mechanistic nature of the system, the player feels intense anguish. It is a raw, primordial thing that courses through your veins and makes breathing difficult. There is really nothing playful or distant about this emotion. The magnitude and newness of the loss directly correlates to the intensity of the experience. Most players I know have great difficulty setting aside the first major loss and pretending that it did not matter. Some will even quit the game because the emotional intensity is just too much to bear. What I find intriguing about this particular emotion reaction is that it pops up in other non-gaming scenarios. Recently I forgot to save a file and in one horrible instant lost hours of labor. The self recrimination and sense of loss is quite similar. In a more extreme example, when the stock market collapsed in the 1920's the emotional response to abrupt and permanent loss was so great that people took to jumping from buildings. The systemic creation of emotion is a powerful phenomena. There are variations on the theme that result in a spectrum of different yet equally reproducible emotions. If the player is struck with lag or a control glitch or they feel that some other player helped cause their demise, the emotional reaction is almost always incandescent rage. Small adjustments to the mechanical systems of cause and effect result in distinct emotional responses. As I write this list, I can't help but realize that these sound like many of the fundamental elements of games. Yes, we can still talk about games-as-systems when we start talking about emotions. There is no need to scurry back to the well worn tropes of evocative media. As game developers, we really do not need the crutch of shadow emotions to create a meaningful emotional experience for our players. Instead, we can succeed by making "games as games" not "games as some bizarrely crippled copy of another industry." I wish I could say more about the exact biological process behind generating primary emotions, but alas it is not my area of expertise. Instead, the best I can do for the moment is to describe the pragmatic process that I use to create desired primary emotions in a population of players. 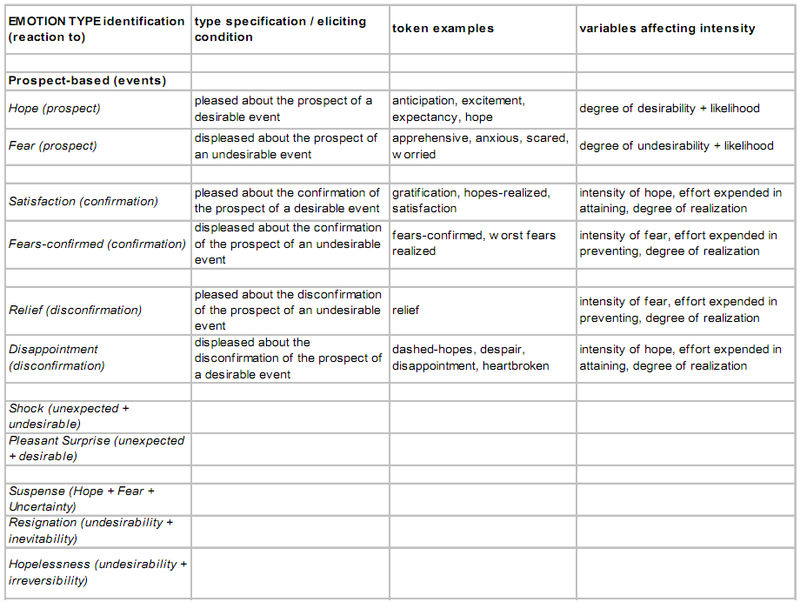 Compare the following process to the one I listed above for shadow emotions. They are rather different. Define: Create mechanics and models that describe a player-centric system of value. What should the player care about and how do the systems and resources reinforce their interest? Acclimate the player to value structures by having them interact with it repeatedly via various loops and processes. Pay careful attention to skill and resource acquisition as well as the formation of social bonds since these must be grown. Trigger: Put the player directly in situations involve a practical loss or gain that triggers the generation of new primary emotions. Label: Apply labels or context to the raw emotion so that players interpret it in the desired fashion. See the two-factor theory of emotion for examples of how contextual labels can transform a base physiological response into a myriad of subtle emotions. You can certainly use evocative stimuli within such a process, but it will always be a supporting tool. The emotions are engineered from the players interactions and experience with the system and not by bombarding someone with images, dialog or sound. Player choice matters. Failure matters. Learning and skill matters. The game matters. My friend Stephane Bura has done important work in mapping game systems onto emotions, but there is far more to be done. I highly recommend you read through his pioneering essay Emotion Engineering in Games. It took several years before it started to sink in, but I'm hoping that you'll have a head start. I've derived immense practical value from the distinction between primary emotions and shadow emotions. Once you've internalized the concept, you can look at a game and ask with great clarity "How is this player emotion being generated?" Once you know the mechanism, you can then take steps to amplify or soften the observed effect. Should you increase the fidelity of visual feedback or merely change a resource variable? If you know neither the type of emotion nor mechanism driving the emotion, you are designing blindly. It is also important that we start talking about how games generate primary emotions. The feeling of victory in a game of Chess is real. The feeling of anger at a Counter Strike camper is real and visceral. The feeling of belonging when you are asked to join a popular guild will stay with you for the rest of your life. We are not reflecting or empathizing (though this can occur in parallel). Due to the interactive nature of the game and our ability to adopt the value structure of the game, there are consequences that are real enough for our body to muster actual new-to-the-world emotions. This is an amazing and fundamental property of games that is at best weakly represented in more traditional media. Let's play to our strengths. Every second you spend blathering on about the damnable Hero's Journey or the role of traditional evocative narrative is a second you could instead be exploring the vast and uncharted frontier of emotional game design. We make games. And games are great and powerful entities in their own right. What happens if you strip out as much of your reliance on shadow emotions as possible and focus your design efforts on creating primary emotions in your players? 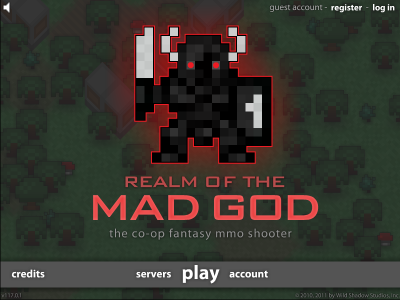 In Realm of the Mad God, the player dies. And he can't come back. It is a harsh penalty with strong sense of failure. Colliding with a 8x8 pixelated bullet with no fidelity, realism or crafted narrative means something emotionally that no movie or novel will ever capture. Note: This essay has gone through a couple drafts based off extensive feedback (which you can read below in the comments). I'm aiming for a version of this essay that is less likely to violently misinterpreted by a majority of readers. Apologies for altering the context of any of the comments below...an unfortunate peril of live editing. Again, let me know where I'm wrong. Let me know which portions makes sense. I read Ben Abraham's weekly summary of game criticism over at Critical Distance. Unlike a decade ago, there is now an absolute deluge of essays being written about games. I see reactions, counter reactions, and copious commentary. What is difficult to find is good writing that dreams of improving the art and craft of games. We need better methods of filtering game criticism. The types of writing about games have exploded. With communities of writers attempting to support highly divergent goals and audiences, simply understanding if an essay is useful is a huge challenge. We need writers who are more deeply educated in the art, craft and science of games. The majority of "game criticism" tends to be informed by a narrow population of gamers, journalists and academics specializing in the humanities. We are often missing experienced perspective from the sciences and the developers of games. The vast body of game criticism is written by people that I would consider partial game illiterates. They are dance judges who have watched Dancing with the Stars, but who have never danced. We need a defined class of game writing that focuses on improving games. The existing community will continue writing about the experience of gaming. But what if there were a small group that wished to do more than talk about playing? Imagine holding your writing to the standard that asks you to ratchet forward the creative conversation. For this tiny crew, judge your writing on its ability to directly improve the art, culture and science of games in an incontrovertible fashion. When I started writing about games, there was hardly anyone talking about games in a thoughtful manner. At best, you had the chatter of more vocal gamers. Even journalists were little more than gamers with a bigger podium. The developers snuck in peer conversations once or twice a year in hotel bars and then went off to toil in intellectual isolation. An admittedly sad state of affairs. Today,we've got the developer blogs on Gamasutra, dozens of conferences, the efforts of the Escapist, the rise of the intellectual game journalist and the slow blossoming of academic writing. The language has improved dramatically. With the arrival of communities of like-minded bloggers and the co-opting of various university departments, writers find themselves encouraged to say what little they can say in increasingly wordy missives. Each week I find myself inundated with essays that appear on the surface to be fascinating treasure troves of insight. When I invest my time digging past the fresh coat of erudite language, much of the content is a regurgitation of the same tired discussion from ages past. Consider Adam Ruch's recent article "First Or Third Person – What’s Your Perspective?" (I chose this example not to be cruel, but because it was at the top of Ben's recent list of game criticism.) Adam is introduced as "a PhD candidate, currently writing about Video Games Criticism" and "a pretty smart guy!" Yet the essay is little more than a series of personal descriptions of how he feels when he plays certain games. There is little insight that couldn't be gained by sitting down with a beer and a controller. There is no attempt at gathering empirical evidence. Adam could have saved everyone a vast amount of time with the TL;DR summary: "In 3rd person you can see (and thus empathize) with a visualized character and in 1st person, you can't." Once you strip away the laborious language, you have yet another bit of fluffy gamer opinion written by a young student. There's a clear and obvious need for writing by young gamers attempting to think about their hobby. Without such essays, you never gains the skills needed to write something better. But there needs to be a better filter. To create a filter, it helps to ask "what is game criticism?" This simple question results in a large range of definitions, each of which is vigorously defended by bespectacled tribal groups. Traditional reviews: The stated goal is to inform players if they should purchase or try a specific game. Enough information is given to enable players to compare various games without actually wasting time or money playing them. Reviews cover games ranging from the latest Mario blockbuster to a smaller indie title deserving of attention. Playthroughs: Where reviews are often (but not always) dry affairs that attempt objectivity, a play through seeks to describe the emotional experience of a game through a single player's eyes. Though I suspect many would disagree, I see the subjective descriptions of gaming found in New Game Journalism as a type of playthrough. Gamer culture: The impact of games on the culture and identity of the players. Connecting games with the humanities: An academic exercise in which various aspects of games are described as being part of an ongoing structure of philosophy, movie criticism, literary criticism, art history, rhetoric, etc. 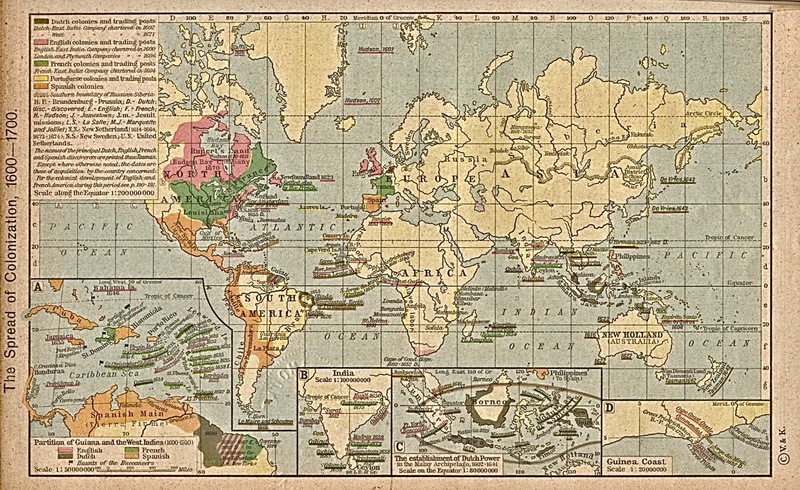 Connecting games with the sciences: An academic exercise in which games are analyzed using the tools of psychology, sociology, economics, etc. Industry analysis: A discussion of large scale trends in the industry such as platforms, new business models and the ever popular unexpected debacle. Game analysis: "Here's a working game. Here's the experiment. Here are the repeatable lessons I learned." Meta-discussions of game criticism: Discussion of the goals, best practices and changes in the broader field of game criticism. This article is one example of such an article. Types of writers: To complicate matters further there are several distinct populations of writers who come with their own goals and target audiences. Journalists: Writers paid to create content for a publication. The larger goal of the publication is often to acquire readers that pay the bills which in turn has a strong impact on the style and content of the writing. Typically journalists targets their writing at mainstream gamers or a sizable niche (such as PC gaming). The goal is to inform, entertain and build a sense of community. There is rarely any explicit call to make games better. Rock Paper Shotgun is a good example of journalists engaging in reviews, playthroughs and the occasional piece of industry analysis. Gamer Hobbyists / Students: People who come from a background of playing games and what to share their thoughts. There is rarely a larger goal and just the fact that someone is reading what they write is often encouragement enough to continue. The audience is often far narrower since there is no economic reason to broaden the reach. Academics / Intellectuals: People who are attempting to build a larger tradition of analysis. They exist in a self-contained, self referencing world of past papers, publishing, and tenure. Their audience is other academics and the language is often hyper specialized. External communication is rare and the bigger goal is the preservation and extension of existing systems of value. There are rare academics that do original experimental research (thank you!). Developers: People who make games. Their audience is other game developers. The higher goal is to improve the art and science of games so that games are alway become better: more expressive, more appealing, more efficient, more effective, more successful. None of this is clearly defined. The types of writers mix together in unexpected ways. They change roles over time. They intentionally obscure their perspective. For example, the writing of journalists for certain sites like IGN may mimic the writing by hobbyists. Or a student might assume the role of an intellectual to give their writing stronger trappings of authority. Some of the writers for Rock Paper Shotgun have started making games. Amusingly, all groups feel like they are in the minority. Hobbyists feel that they must constantly burst forth in YMCA-style song about gamer pride or the Man will crush their love of games. Journalists feel no one appreciates their heroic efforts at balancing gamer passion, cultural translations and commercialization. Academics huddle in their isolated departments and wonder why no one listens when they speak the Truth (as defined by a philosopher from the 1970's). Game developers are too busy crunching or being fired to write much and generally respond in grunts as a result. 'Touchy' is as good a description as any single segment for the entire crew. Which makes even agreeing on goals, categories and terms difficult. Here's an attempt: If I were to categorize Andy's article: He is a student acting as an academic, writing what is essentially a playthrough that in turn masquerades as game analysis. The fact that he is a student writing a playthrough is fine. The multiple levels of deception are what initially raised my hackles. Given this, if you fail to disclose your perspective, you are very likely wasting the precious time of your reader. If you deliberately obscure this information (as I've seen many student or indies tempted to do) you are being a dishonest member of our community. Hey! Stop doing that...there is no shame in writing openly and honestly that you are a gamer expressing your love and appreciation for games. Just don't obscure your intent with faux intellectualism. Dominant Majority: Journalists and hobbyist gamers writing reviews and playthroughs make up the bulk of the writing on games. There are very naturally more gamers than any other group so it is quite reasonably that gamers and those that serve gamers produce the highest volume of game writing. Growing Minority: Academics and intellectuals connecting the dots between games and the humanities are another major category and rally under the 'game criticism' label. 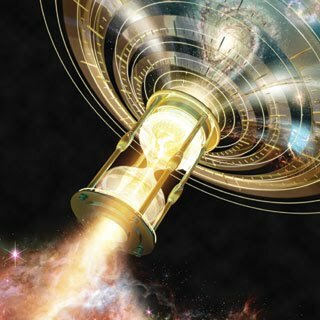 Dwindling Minority: Game analysis, and essays that connect games with the sciences are far less common. There are a handful of trade sites like Gamasutra that keep the light alive, but in general it is a desert out there. When I look at this distribution, something strikes me as odd: the vast majority of the rest of writers listed above do not make games, nor do they understand how games are made. I can understand that there are many writers who are happy just to marinate in the warm communal bath of gamer burbling. I've heard many a gamer tell me that they have no need for any additional knowledge or perspective on games other than what they gain through the playing of games. Yet I also imagine a mythical writer that wants to uncover additional insights into what makes games tick. For these curious souls, having hands-on experience making games gives them the ability to observe nuances that no other gamer-only critic could manage. For those of you instantly think of C++ when you hear the term 'making games', I am very specifically not talking about programming or technical skills. By making games, be it board games, inventing new sports or making even the simplest of indie games, you gain insight into the fundamental structure of games and how they produce the end user experience that we all find so valuable. You start to understand interaction loops, pacing, skill acquisition, randomness, how narrative supports mechanics, play styles and dozens of others of foundational game concepts that are difficult to derives from the experiences of being just a gamer. These are not passing trends in engineering or technology. These are the bones of what makes a game a game. Consider the act of judging dances. Dancing (like making games) is a highly technical craft that may be enjoyed superficially or judged in a rigorous fashion. On one hand you have a trained dancer. On the other hand, you have someone who has watched Dancing with the Stars, but never fully engaged in the practical mastery necessary to understand the foundations of the art. I submit that if both have comparable skills of analysis and communication, the one with personal experience as a dancer would make the more informed critic. In general, game criticism tends not to be informed hands-on knowledge about what it takes to make a competent game. In the past week of essays on Critical Distance, I found 1 writer of 12 had any declared experience making games. This is all of course highly intentional on the part of the promoters of game criticism by gamers. When they look for role models in other media, they see no need for understanding the lowly techniques of creation. Naive consumption without a deep understanding of form is seen by some as a means of recording a gamer's reactions without undue outside influence. Purely evocative media as music, video, writing or painting can often be reasonable well described using tools from the humanities and the personal reaction of an individual. If I want to understand a novel, a single sample has limitations, but it can convey the essence of the experience surprisingly well. Yet though games do possess evocative elements, they also are driven by a functional heart that resists being reduced to only the softest of sciences. Bridges, though undeniably aesthetic and cultural objects, can also be understood as functional or economic creations. Playthroughs, aesthetics, rhetoric, literary theory, film theory, art history may be one set of valuable perspectives, but if you only rely on these, you will fail to paint a complete picture the babbling, whirring human-mechanical reality of a games. There is so much about games that is missing from the majority of today's writing. Games have much in common with functional works involving mathematics, psychology, governments, economics or other complex systems. Given population A with skills B, we experimentally validate that we get result C. We have a rich tradition of design practice stretch across Miyamoto to Sid Meier to modern metrics-driven social games. There exists game design theory stemming from folks like Chris Crawford, Eric Zimmerman and Raph Koster. The instinct of practicing designers alone is an immense iceberg of unwritten knowledge just waiting to be described and shared. These are vast fields that are mostly untapped by today's writer. And for good reason. You can only dig into them at the root if you devote a large hunk of your life to mastering them through direct experience. This means making games in a thoughtful manner and then sharing those insights with those who will only play. Such people are rare. We need to train more of them. I suspect that it is too late for the field of game criticism to ever again broadly mean 'critical thoughts about games'. Somewhere along the line we imported wholesale too much baggage from media that long ago stagnated under the weight of navel-gazing divorced from practice. Instead, we need a new field of discussion. Let's expand up on the topic above I called Game Analysis. Goal: Advance the art and science of games. Simply looking at what exists is not enough. Instead, we leverage what exists in order to to ask what is next and create the conceptual language and tools that get us there. Audience: Anyone interested in deeply considering how to improve games. Make games. Again and again and again. Understand why games work by making games that work. Study the fields of science that deal with complex functional systems. Devour any and all existing writing both on games and on other unrelated fields to see if they might move the dial forward. Share and discuss useful thoughts from your newly enlightened perspective. Simply making games does not make you a good at game analysis. I have a friend who makes games, but publicly writes gamer-esque ramblings. Then he wonders why no one pays attention. A developer ranting about their personal, emotional experience with the controls in Super Meat Boy from the perspective of 'Dude, I'm a gamer just like you" no more improves the state of games than a 13-year old gamer engaged in creating entertainment for his blog. Think deeply about what you do and contribute meaningful writing. I love the visual of a ratchet. Every click advances and builds a foundation of steel that will not let the whole fall backwards. Grounded: Are you basing your theories off empirical evidence? Do not write something merely because you had a feeling to express. Aware: Do you know what other people have written in the past? Do the research and be an informed commenter. Insightful: Does your writing add a substantial new perspective or tool that moves the conversation forward? Do not rehash the same old thing simply because you have an opinion on the currently popular meme. Actionable: Does your writing identify a course of action that previously was obscured? Do not let an exploration of an idea wander off into vague hand-waving. Ask the reader to perform an experiment that increases the knowledge of the community as a whole. There is a clear benefit when you follow these guidelines. Your writing stands out from the muck. The world craves a path forward and the intelligent people you attract by being a grounded, aware, insightful and actionable writer open doors that you would never otherwise find. You improve the world. Your small contributions build upon the work of others to create a mountain of human endeavor that builds our medium to heights we can only barely imagine. As a small closing note, I do realize that many writers are happy writing as only gamers or only journalists or only a specific sub-branch of academia and see no need to branch out. But we can do more. I come at this topic with the personal belief that merely rehashing the works of others is not nearly enough. As a creator, you have only a few short years to build something great that changes the world. Hold yourself to a higher standard. Be more than a gamer who is writing about personal experiences. 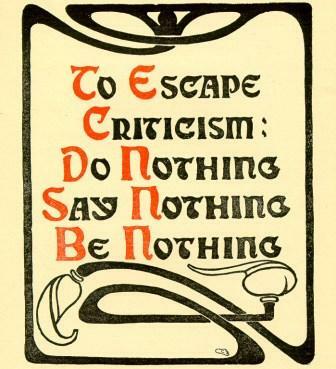 Be more than an academic trying to force games into a 200-year old history of criticism. Take this weekend, grab some dice and build a game. Play test it (you aren't building games unless you do). Polish it. Release it. Ask yourself what this tells you about the nature of games and incorporate that critical perspective into your writing. 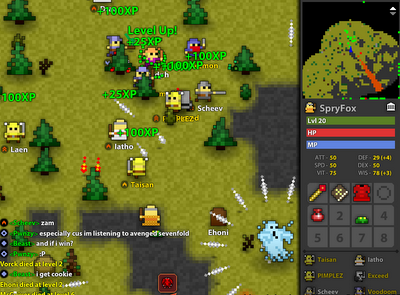 As years pass and you release your 10th or 20th game, reflect on what have you learned. Share your journey with the world and raise the level of conversation. Most game criticism is not for developers so none of this matters: You are correct. This essay is only for those rare writers who wish to improve their craft by mastering new perspectives that are fundamental to the art and science of games. Game criticism is not about improving games. It is about studying what exists: I understand that there are people who prefer to be historians, catalogers and masticators of culture. There is still room for both catalogers and people who dream about the future. Perhaps not under the banner of 'game criticism' but certainly within games as whole. But making games is engineering and that is dull and soulless: No, it isn't. Only a small portion of making games is the technical craft of drawing numbers on cardboard (if it is a board game) or getting triangles to show up (if it is a 3D video game). Games are about building systems of rules, affordances and people. They are art, science and community rolled up into one giant holistic act of creativity and play. To make games well, you need to understand the whole picture. I desire more writing from this holistic perspective, not from one narrow and highly uninformed perspective. How will game developers know what players are feeling if not for game criticism? : Game developers are constantly looking at a vast range of quantitative and qualitative data. The entire process of game development is built around observing players and adjusting the game (thousands of times!) till the system reaches a desired state of operation. Individual opinions are constantly taken into account. I personally love watching players and asking them directly what they feel. In light of this, having a piece of well written criticism is often interesting, but needs to be balanced against the weight of other (often more representative) players. Since the critic almost never understands the systems underlying their experience, most notes on improvements or root causes are typically wildly off base. This isn't the fault of the game critic. They simply lack access to both the dozens (or thousands) of player data points and the intimate knowledge of the game mechanics. Perhaps one out of a hundred provides a minor insight into a specific game.